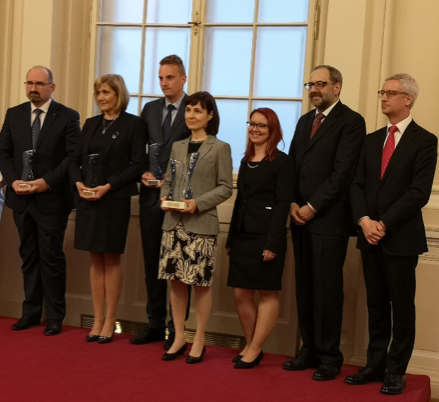 We would like to offer a big “Congratulations!” to Prof Barbara Koroušić Seljak this year’s The Young Academy of Slovenia Mentor of the Year Award 2018 winner. The Young Academy of Slovenia Mentor of the Year Award 2018 awards recognizes outstanding mentors who have demonstrated a longstanding commitment to student success and development. A good mentor is one who effectively advises, guides, and inspires his/her students throughout their research training, while helping them to navigate obstacles, whether personal, professional, or academic. This year’s deserved winner is Barbara Koroušić Seljak from the Computer Sciences Department, Jožef Stefan Institute. Prof Barbara Koroušić Seljak works closely with of the Department of Environmental Sciences, a valued member of ERA Chair ISO-FOOD Team and mentor to Dr Tome Eftimov who as an ISO-FOOD funded doctoral student in January 2018 successfully defended his thesis entitled “Statistical data analysis and natural language processing for nutrition science”. Tome Eftimov currently works as a Postdoctoral Research Fellow at the Centre for Population Health Sciences, Stanford University, USA. As well as an outstanding mentor, Prof Barbara Koroušić Seljak is an accomplished researcher in her own right, and has made significant contributions in real-time and embedded computer systems and statistics, including topics such as evolutionary computation, natural language processing, machine learning, and data analysis in relation to public and clinical nutrition, and nutrition science.